The announcement of Tibetan spiritual leader, the Dalai Lama on March 10 of his decision to ‘retire’ doesn’t come as a surprise. The Chinese reaction was on predictable lines though he has taken the wind out of Chinese sails by calling for a ‘political’ successor. The announcement of Tibetan spiritual leader, the Dalai Lama on March 10 of his decision to retire from active politics doesn’t come as a surprise. The Chinese reaction was on predictable lines. China termed the resignation as a ‘trick to deceive’ the world. ‘He (Dalai Lama) has often talked about retirement in the past few years. I think these are his tricks to deceive the international community,” foreign ministry spokeswoman Jiang Yu told reporters in Beijing. But close observers of the Tibetan scene point out that there is no suddenness in the Dalai Lama’s decision. He has been speaking of the need to pass on the baton to a younger leader citing among other things his age. Born as Lhamo Thondup (literally Wish-Fulfilling Goddess) on July 6, 1935 to a poor peasant family in the small village of Taktser (means Roaring Tiger) in the province of Amdo, he was barely three-year old when he was ‘discovered’ at Kumbum monastery as the successor of the Thirteenth Dalai Lama, Thupten Gyatso (1876 – 1933). “My desire to devolve authority”, the Dalai Lama said in his statement, “has nothing to do with a wish to shirk responsibility. 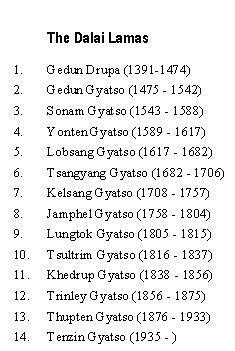 It is to benefit Tibetans in the long run. It is not because I feel disheartened”. Nevertheless, the timing of the ‘resignation’ is significant. It coincided with the anniversary of the ‘uprising’ in Tibet in 1959. Four days from today, Tibetan Parliament –in-exile would begin its 11th session. The 75-year-old Nobel Peace Prize winner would like to see the ‘free election’ of his successor at the parliament session. This picturesque Himalayan town has been his abode ever since he fled his native Tibet in 1959 after a failed uprising. The uprising was as much against the Chinese rule as for protection of Tibet’s religious and cultural values as much as it was to fight for their country. “The people of Kham, or Eastern Tibet, rose up against Chinese occupation when Communist authorities began to implement ‘democratic reforms’, the program to eliminate monastic and tribal leadership and eradicate the traditional social system,” recalls Jamyang Norbu, the author of Warriors of Tibet: The Story of Aten and the Khampas’ Fight for the Freedom of their Country ( Wisdom, Boston 1986). He estimates the number of Tibetans who died in the uprising at half a million. Violent insurrections had taken place earlier in Eastern Tibet in Gyalthang (south of Lithang) in 1952 and also in north-eastern Tibet (Amdo) in Hormukha and Nangra. While the two uprisings took heavy toll and ‘left only a few blind men, cripples, fools and some children’ according to eye witnesses, the Khampa uprisings on the 18th day of Tibetan New Year of 1956 was truly broad based. It was well coordinated also. 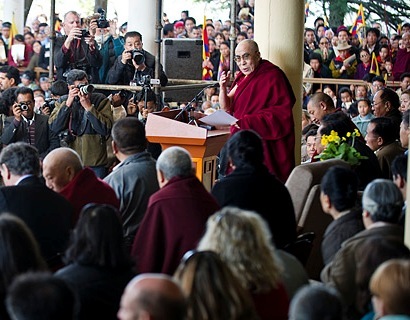 The Dalai Lama, in his own words, has been a ‘free spokesperson of the Tibetan people’. He repeatedly ‘spelled out their fundamental aspirations to the leaders of the People’s Republic of China’. He was disappointed by the ‘lack of a positive response’. Yet his counsel to the Tibetan faithful is patience. ‘….judging by the political changes taking place on the international stage as well as changes in the perspective of the Chinese people, there will be a time when truth will prevail. Therefore, it is important that everyone be patient and not give up,’ he said last year (2010). Not withstanding his optimism, there are no signs of Beijing changing. ATTACKS STEPPED UP On the eve of ‘Uprising’s anniversary’, and marking the third anniversary (March 14, 2008) of bloody riots in Lhasa next week, China placed restrictions on the entry of foreign tourists. Jiang Yu, the Foreign Ministry spokesperson, attributed the restrictions to ‘bitterly cold winter weather’ and ‘limited accommodation capacity’ and ‘safety concerns’. Foreign media has no free access to Tibet even during normal times; special permissions are required to visit the region. Ahead of Lhasa riots anniversary, Chinese officials have stepped up attack against the Dalai Lama. A Tibetan Communist party official dubbed the Tibetan spiritual leader as a ‘wolf in monk’s robes’. A former Tibet Governor Qiangba Puncog told the media in Beijing that when Dalai Lama dies, it will trigger small shock waves in Tibet but won’t result in serious instability, while the present governor Padma Choling, said the Dalai has no right to abolish the institution of reincarnation and thereby underscored the continued hard-line stance on China. He went on to add ‘Dalai Lama does not have a right to choose his successor any way he wants and must follow the historical and religious tradition of reincarnation’. On its part, the Chinese government has been saying all along that it has to approve all reincarnations of living Buddhas in Tibetan Buddhism. China wants to sign off on the choosing of the next Dalai Lama. Many Tibetans at home and exile have spurned the Chinese-appointed Panchen Lama as a fake. But will that experience stop China from naming its own successor, to the 14th Dalai Lama? If it doesn’t, it raises the possibility of there being two Dalai Lamas — one recognized by China and the other chosen by exiles or with the blessing of the current Dalai Lama. The Tibetan Buddhism has a history of more than 1,000 years, and the reincarnation institutions of the Dalai Lama and Panchen Lama have been carried on for several hundred years. The Dalai Lama appears conscious of the possibilities. A reading of his statement on his successor makes this clear. He is not asking selection of a spiritual successor. He is asking for the selection of a political successor. And he wants the selection to be through a free election by Tibetan Parliament –in- exile. Post -1956, the Dalai Lama has come to be the spiritual and political centre even as he said ‘I have no difficulty accepting that I am spiritually connected both to the thirteen previous Dalai Lamas, to Chenrezig and to the Buddha himself’. And acknowledged the ‘repeated and earnest requests both from within Tibet and outside, to continue to provide political leadership’. His campaign against Chinese repression is both political and diplomatic in nature. For instance his latest statement says: ‘The Chinese government claims there is no problem in Tibet other than the personal privileges and status of the Dalai Lama. The reality is that the ongoing oppression of the Tibetan people has provoked widespread, deep resentment against current official policies. People from all walks of life frequently express their discontentment. That there is a problem in Tibet is reflected in the Chinese authorities’ failure to trust Tibetans or win their loyalty. Instead, the Tibetan people live under constant suspicion and surveillance. Chinese and foreign visitors to Tibet corroborate this grim reality’. So the Dalai Lama’s desire to devolve formal authority to the elected leader is bound to stump the Chinese. Because an elected leader will be much more free to articulate the aspiration of the present day Tibetans in exile. By facilitating the process, the 14th Dalai Lama may be achieving his predecessor Thupten Gyatso’s goal for Tibet’s modernization. This entry was posted in Uncategorized and tagged Beijing, China, Dalai Lama, Dharamsala, Jamyang Norbu, Lhamo Thondup, Panchen Lama, Qiangba Puncog, Thupten Gyatso, Tibetan uprising. Bookmark the permalink.